"Boric" redirects here. For other uses, see Boric (disambiguation). Boric acid, also called hydrogen borate, boracic acid, orthoboric acid and acidum boricum, is a weak, tribasic Lewis acid of boron, which is often used as an antiseptic, insecticide, flame retardant, neutron absorber, or precursor to other chemical compounds. It has the chemical formula H3BO3 (sometimes written B(OH)3), and exists in the form of colorless crystals or a white powder that dissolves in water. When occurring as a mineral, it is called sassolite. Boric acid, or sassolite, is found mainly in its free state in some volcanic districts, for example, in the Italian region of Tuscany, the Lipari Islands and the US state of Nevada. In these volcanic settings it issues, mixed with steam, from fissures in the ground. It is also found as a constituent of many naturally occurring minerals – borax, boracite, ulexite (boronatrocalcite) and colemanite. Boric acid and its salts are found in seawater. It is also found in plants, including almost all fruits. Boric acid was first prepared by Wilhelm Homberg (1652–1715) from borax, by the action of mineral acids, and was given the name sal sedativum Hombergi ("sedative salt of Homberg"). However borates, including boric acid, have been used since the time of the ancient Greeks for cleaning, preserving food, and other activities. The term boric acid may sometimes refer to any of these compounds. Further heating (to about 330 °C) leads to boron trioxide. This may be characterized as Lewis acidity of boron toward OH−, rather than as Brønsted acidity. Boric acid makes an important contribution to the absorption of low frequency sound in seawater. With polyols such as glycerol and mannitol the acidity of the solution is increased. With mannitol for example the pK decreases to 5.15. This is due to the formation of a chelate, [((OH)4C6H8O2)2B]−, and this feature is used in analytical chemistry. The three oxygen atoms form a trigonal planar geometry around the boron. The B-O bond length is 136 pm and the O-H is 97 pm. The molecular point group is C3h. 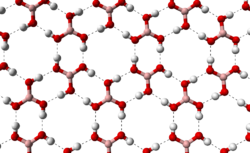 Crystalline boric acid consists of layers of B(OH)3 molecules held together by hydrogen bonds of length 272 pm. The distance between two adjacent layers is 318 pm. Based on mammalian median lethal dose (LD50) rating of 2,660 mg/kg body mass, boric acid is only poisonous if taken internally or inhaled in large quantities. The Fourteenth Edition of the Merck Index indicates that the LD50 of boric acid is 5.14 g/kg for oral dosages given to rats, and that 5 to 20 g/kg has produced death in adult humans. For comparison's sake, the LD50 of salt is reported to be 3.75 g/kg in rats according to the Merck Index. According to the Agency for Toxic Substances and Disease Registry, "The minimal lethal dose of ingested boron (as boric acid) was reported to be 2–3 g in infants, 5–6 g in children, and 15–20 g in adults. [...] However, a review of 784 human poisonings with boric acid (10–88 g) reported no fatalities, with 88% of cases being asymptomatic." Long-term exposure to boric acid may be of more concern, causing kidney damage and eventually kidney failure (see links below). Although it does not appear to be carcinogenic, studies in dogs have reported testicular atrophy after exposure to 32 mg/kg bw/day for 90 days. This level is far lower than the LD50. According to the CLH report for boric acid published by the Bureau for Chemical Substances Lodz, Poland, boric acid in high doses shows significant developmental toxicity and teratogenicity in rabbit, rat, and mouse fetuses as well as cardiovascular defects, skeletal variations, and mild kidney lesions. As a consequence in the 30th ATP to EU directive 67/548/EEC of August 2008, the European Commission decided to amend its classification as reprotoxic category 2, and to apply the risk phrases R60 (may impair fertility) and R61 (may cause harm to the unborn child). The primary industrial use of boric acid is in the manufacture of monofilament fiberglass usually referred to as textile fiberglass. Textile fiberglass is used to reinforce plastics in applications that range from boats, to industrial piping to computer circuit boards. In the jewelry industry, boric acid is often used in combination with denatured alcohol to reduce surface oxidation and firescale from forming on metals during annealing and soldering operations. Boric acid is used in the production of the glass in LCD flat panel displays. Boric acid, mixed with borax (sodium tetraborate decahydrate) at the weight ratio of 4:5, is highly soluble in water, though they are not so soluble separately. The solution is used for fire retarding agent of wood by impregnation. It is also used in the manufacturing of ramming mass, a fine silica-containing powder used for producing induction furnace linings and ceramics. Boric acid is one of the most commonly used substances that can neutralize active hydrofluoric acid (HF). It works by forcing the free F− anions into complex salts. This process defeats the extreme toxicity of hydrofluoric acid, particularly its ability to sequester ionic calcium from blood serum which can lead to cardiac arrest and bone decomposition; such an event can occur from just minor skin contact with HF. Boric acid is added to borax for use as welding flux by blacksmiths. Boric acid, in combination with silicone oil, is used to manufacture Silly Putty. Boric acid may be used in Marcellus Shale hydraulic fracturing in Pennsylvania. Boric acid can be used as an antiseptic for minor burns or cuts and is sometimes used in salves and dressings, such as boracic lint. Boric acid is applied in a very dilute solution as an eye wash. Dilute boric acid can be used as a vaginal douche to treat bacterial vaginosis due to excessive alkalinity, as well as candidiasis due to non-albicans candida. As an antibacterial compound, boric acid can also be used as an acne treatment. It is also used as prevention of athlete's foot, by inserting powder in the socks or stockings, and in alcohol solution can be used to treat some kinds of otitis externa (ear infection) in both humans and animals. The preservative in urine sample bottles in the UK is boric acid. Boric acid solutions used as an eye wash or on abraded skin are known to be toxic, particularly to infants, especially after repeated use; this is because of its slow elimination rate. Boric acid was first registered in the US as an insecticide in 1948 for control of cockroaches, termites, fire ants, fleas, silverfish, and many other insects. The product is generally considered to be safe to use in household kitchens to control cockroaches and ants. It acts as a stomach poison affecting the insects' metabolism, and the dry powder is abrasive to the insects' exoskeletons. Boric acid also has the reputation as "the gift that keeps on killing" in that cockroaches that cross over lightly dusted areas do not die immediately, but that the effect is like shards of glass cutting them apart. This often allows a roach to go back to the nest where it soon dies. Cockroaches, being cannibalistic, eat others killed by contact or consumption of boric acid, consuming the powder trapped in the dead roach and killing them, too. In combination with its use as an insecticide, boric acid also prevents and destroys existing wet and dry rot in timbers. It can be used in combination with an ethylene glycol carrier to treat external wood against fungal and insect attack. It is possible to buy borate-impregnated rods for insertion into wood via drill holes where dampness and moisture is known to collect and sit. It is available in a gel form and injectable paste form for treating rot affected wood without the need to replace the timber. Concentrates of borate-based treatments can be used to prevent slime, mycelium, and algae growth, even in marine environments. Boric acid is added to salt in the curing of cattle hides, calfskins, and sheepskins. This helps to control bacterial development, and helps to control insects. Boric acid in equilibrium with its conjugate base the borate ion is widely used (in the concentration range 50 - 100 ppm boron equivalents) as a primary or adjunct pH buffer system in swimming pools. Boric acid is a weak acid, with pKa (the pH at which buffering is strongest because the free acid and borate ion are in equal concentrations) of 9.24 in pure water at 25 °C. But apparent pKa is substantially lower in swimming pool or ocean waters because of interactions with various other molecules in solution. It will be around 9.0 in a salt-water pool. No matter which form of soluble boron is added, within the acceptable range of pH and boron concentration for swimming pools, boric acid is the predominant form in aqueous solution, as shown in the accompanying figure. The boric acid - borate system can be useful as a primary buffer system (substituting for the bicarbonate system with pKa1 = 6.0 and pKa2 = 9.4 under typical salt-water pool conditions) in pools with salt-water chlorine generators that tend to show upward drift in pH from a working range of pH 7.5 - 8.2. Buffer capacity is greater against rising pH (towards the pKa around 9.0), as illustrated in the accompanying graph. The use of boric acid in this concentration range does not allow any reduction in free HOCl concentration needed for pool sanitation, but it may add marginally to the photo-protective effects of cyanuric acid and confer other benefits through anti-corrosive activity or perceived water softness, depending on overall pool solute composition. Colloidal suspensions of nanoparticles of boric acid dissolved in petroleum or vegetable oil can form a remarkable lubricant on ceramic or metal surfaces with a coefficient of sliding friction that decreases with increasing pressure to a value ranging from 0.10 to 0.02. Self-lubricating H3BO3 films result from a spontaneous chemical reaction between water molecules and B2O3 coatings in a humid environment. In bulk-scale, an inverse relationship exists between friction coefficient and Hertzian contact pressure induced by applied load. Boric acid is used to lubricate carrom and novuss boards, allowing for faster play. Boric acid is used in some nuclear power plants as a neutron poison. The boron in boric acid reduces the probability of thermal fission by absorbing some thermal neutrons. Fission chain reactions are generally driven by the probability that free neutrons will result in fission and is determined by the material and geometric properties of the reactor. Natural boron consists of approximately 20% boron-10 and 80% boron-11 isotopes. Boron-10 has a high cross-section for absorption of low energy (thermal) neutrons. By increasing boric acid concentration in the reactor coolant, the probability that a neutron will cause fission is reduced. Changes in boric acid concentration can effectively regulate the rate of fission taking place in the reactor. Boric acid is used only in pressurized water reactors (PWRs) whereas boiling water reactors (BWRs) employ control rod pattern and coolant flow for power control. BWRs use an aqueous solution of boric acid and borax or Sodium Pentaborate for an emergency shut down system. Boric acid may be dissolved in spent fuel pools used to store spent fuel elements. The concentration is high enough to keep neutron multiplication at a minimum. Boric acid was dumped over Reactor 4 of the Chernobyl Nuclear Power Plant after its meltdown to prevent another reaction from occurring. Boron is used in pyrotechnics to prevent the amide-forming reaction between aluminum and nitrates. A small amount of boric acid is added to the composition to neutralize alkaline amides that can react with the aluminum. Boric acid can be used as a colorant to make fire green. For example, when dissolved in methanol it is popularly used by fire jugglers and fire spinners to create a deep green flame. Boric acid is used to treat or prevent boron deficiencies in plants. It is also used in preservation of grains such as rice and wheat. For the game of carrom, boric acid is sprinkled onto the board of play to act as a dry lubricant to increase the speed of the pieces when struck. ^ Allen, A. H.; Tankard, A. R. (1904). "The Determination of Boric Acid in Cider, Fruits, etc". Analyst. 29 (October): 301–304. Bibcode:1904Ana....29..301A. doi:10.1039/an9042900301. ^ Housecroft, C. E.; Sharpe, A. G. (2008). "Chapter 13: The Group 13 Elements". Inorganic Chemistry (3rd ed.). Pearson. p. 340. ISBN 978-0-13-175553-6. ^ Balci, Suna; Sezgi, Naime; Eren, Esin (2012). "Boron Oxide Production Kinetics Using Boric Acid as Raw Material". Industrial & Engineering Chemistry Research. 51 (34): 11091–11096. doi:10.1021/ie300685x. ^ a b Jolly, W. L. (1984). Modern Inorganic Chemistry. McGraw-Hill. p. 198. ^ a b Housecroft, C.E. ; Sharpe, A.G. (2005). Inorganic Chemistry (2nd ed.). Pearson Prentice-Hall. pp. 314–5. ^ a b MHE. Comprehensive Chemistry for JEE Advanced 2014. Tata McGraw-Hill Education. p. 15.5. ISBN 9781259064265 – via Google Books. ^ a b Darpan, Pratiyogita (1 May 2000). "Competition Science Vision". Pratiyogita Darpan – via Google Books. ^ "Underlying Physics and Mechanisms for the Absorption of Sound in Seawater". National Physical Laboratory. Retrieved 21 April 2008. ^ Brown, Herbert C.; Mead, Edward J.; Shoaf, Charles J. (1956). "Convenient Procedures for the Preparation of Alkyl Borate Esters". J. Am. Chem. Soc. 78 (15): 3613–3614. doi:10.1021/ja01596a015. ^ "CLH report for boric acid - Proposal for Harmonised Classification and Labelling" (PDF). Lodz, Poland: Bureau for Chemical Substances. 23 April 2018. Retrieved 18 October 2018. ^ "Boric acid, ACC# 03260 MSDS" (PDF). 11 February 2008. Archived from the original (PDF) on 16 December 2011. Retrieved 24 September 2009. ^ Ishii, Y.; Fujizuka, N.; Takahashi, T.; et al. (1993). "A Fatal Case of Acute Boric Acid Poisoning". Clinical Toxicology. 31 (2): 345–352. doi:10.3109/15563659309000402. PMID 8492348. ^ Restuccio, A.; Mortensen, M. E.; Kelley, M. T. (1992). "Fatal Ingestion of Boric Acid in an Adult". American Journal of Emergency Medicine. 10 (6): 545–547. doi:10.1016/0735-6757(92)90180-6. PMID 1388380. ^ Duldner, J. E. (30 January 2009). "Boric Acid Poisoning". A.D.A.M. Medical Encyclopedia. MedLine Plus. ^ NSW Food Authority. "Borax and Boric Acid". Australia: New South Wales Government. Retrieved 24 September 2009. ^ "BORIC ACID AS A SUBSTANCE OF VERY HIGH CONCERN BECAUSE OF ITS CMR PROPERTIES" (PDF). ECHA Document library. ^ Kistler, R. B.; Helvaci, C. (1994). "Boron and Borates". In Carr, D. D. (ed.). Industrial Minerals and Rocks (6th ed.). Littleton, CO: SME. pp. 171–186. ^ Tsuyumoto, I.; Oshio, T.; Katayama, K. (2007). "Preparation of Highly Concentrated Aqueous Solution of Sodium Borate". Inorganic Chemistry Communications. 10 (1): 20–22. doi:10.1016/j.inoche.2006.08.019. ^ Tsuyumoto, I.; Oshio, T. (2009). "Development of Fire Resistant Laminated Wood Using Concentrated Sodium Polyborate Aqueous Solution". Journal of Wood Chemistry and Technology. 29 (4): 277–285. doi:10.1080/02773810903033721. ^ "Method 3052 microwave assisted acid digestion of siliceous and organically based matrices" (PDF). US EPA. 22 June 2015. ^ Dempsey, Jock (2009) . "BORAX". Dempsey's Forge. Retrieved 23 July 2010. ^ Prager, Felice. "Science Becomes a Toy - Silly Putty". Loti.com. Rewind the Fifites. Archived from the original on 12 May 2013. Retrieved 7 June 2013. ^ "Chemicals Used by Hydraulic Fracturing Companies in Pennsylvania for Surface and Hydraulic Fracturing Activities" (PDF). Pennsylvania Department of Environmental Protection, Bureau of Oil and Gas Management. 30 June 2010. ^ Abercrombie, P. (2010). "Vaginitis". In Maizes, V.; Low Dog, T. (eds.). Integrative Women's Health. New York, NY: Oxford University Press. p. 192. ISBN 978-0-19-537881-8. ^ Iavazzo C, Gkegkes ID, Zarkada IM, Falagas ME (August 2011). "Boric acid for recurrent vulvovaginal candidiasis: the clinical evidence". J Womens Health (Larchmt). 20 (8): 1245–55. doi:10.1089/jwh.2010.2708. PMID 21774671. ^ Harvey, S. C. (1980). "Antiseptics and Disinfectants; Fungicides; Ectoparasiticides". In Gilman, A. G.; Goodman, L. S.; Gilman, A. (eds.). Goodman & Gillman's The Pharmacological Basis of Therapeutics (6th ed.). p. 971. ISBN 978-0-02-344720-4. ^ Birch, Robert G (2013). "Boric acid as a swimming pool buffer" (pdf). The University of Queensland. Retrieved 30 November 2013. ^ Düzcükoğlu, H.; Acaroğlu, M. (2009). "Lubrication Properties of Vegetable Oils Combined with Boric Acid and Determination of Their Effects on Wear". Energy Sources, Part A: Recovery, Utilization, and Environmental Effects. 32 (3): 275–285. doi:10.1080/15567030802606053. ^ Singh, Harpreet. "Standard equipments". Punjab State Carrom Association. Retrieved 24 September 2009. ^ Weingart, George (1947). Pyrotechnics. Chemical Publishing Company. ISBN 978-0820601120. ^ "Why is boric powder used in carrom boards?". Tata Chemicals: Let's Talk Chemistry. Archived from the original on 18 July 2012. Retrieved 18 July 2012. Jolly, W. L. (1991). Modern Inorganic Chemistry (2nd ed.). New York: McGraw-Hill. ISBN 978-0-07-112651-9. Goodman, L.; Gilman, A.; Brunton, L.; Lazo, J.; Parker, K. (2006). Goodman & Gilman's The Pharmacological Basis of Therapeutics. New York: McGraw Hill.